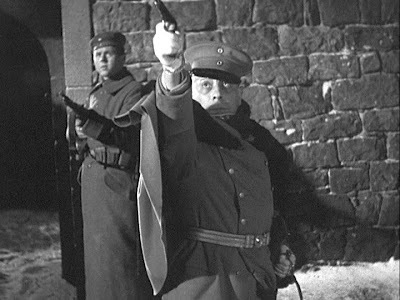 Jean Renoir’s most popular and well-known work, La Grande Illusion (Grand Illusion, 1937), is considered one of the all-time great anti-war films, but there is almost no combat portrayed. Instead, the action, set mostly in World War I German prisoner-of-war camps, concerns the escape efforts of several French officers confined in the camps. Made just before the onset of World War II, the film stands more as a testament to the brotherhood of mankind, than it does as an explicit depiction of the futility of war. But with the imminent threat of fascism sweeping across Europe at the time, the film’s ultimately humanistic message concentrates on the positive alternatives and avoids merely dwelling on the horrors of violence and suffering. 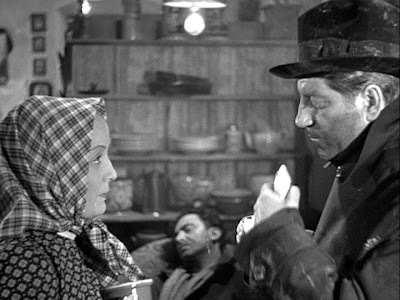 Jean Gabin plays Lieutenant Marechal. Gabin was a rapidly rising film star in France, who would also appear in Julien Duvivier’s Pépé le Moko (1937), Marcel Carne’s Le Quai des Brumes (1938) and Le Jour Se Leve (1939), and Renoir’s La Bête Humaine. 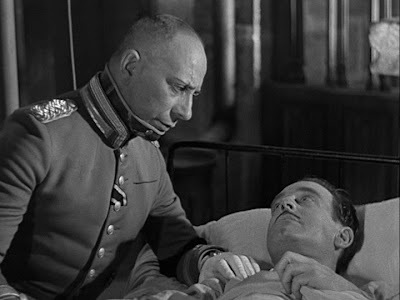 Erich von Stroheim gives a mesmerizing performance in the role of Captain von Rauffenstein. Von Stroheim was a famous director in the silent era, and his work had been an inspiration to the youthful Renoir during his formative stages. 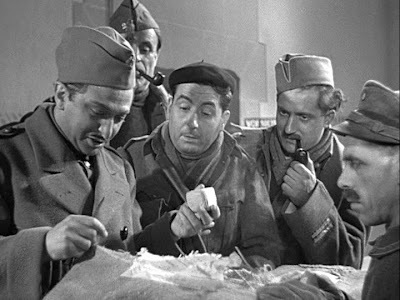 Marcel Dalio, who plays the key role of a Jewish soldier in this film, Lieutenant Rosenthal, also played a major role in La Règle du Jeu. The Jewish Dalio’s real, original name was Israel Moshe Blauschild, and both his parents died in Nazi concentration camps. He, himself, just managed to escape the invading Nazis in 1940. Julien Carette plays the stage actor Cartier. This role was something of an homage to Charlie Chaplin, the viewing of whose films enthralled the young Renoir and inspired him to take up filmmaking. 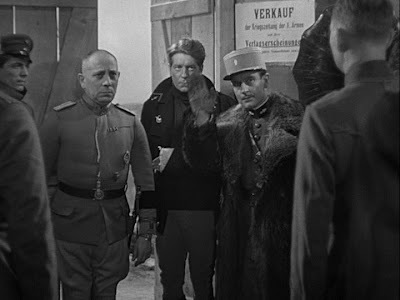 Pierre Fresnay plays the urbane Captain de Boeldieu. He had earlier appeared in Hitchcock’s The Man Who Knew Too Much (1934). Dita Parlo, a popular German actress, plays the German widow E lsa. The story of the film comprises a narrative prologue, followed by three somewhat separate mini-narratives that have been strung together. Act 1: Introduction. Lieutenant Marechal is assigned to accompany Captain de Boeldieu on an aircraft reconnaissance mission to overfly German territory. They are shot down by German flying ace, Captain von Rauffenstein and taken prisoner. When von Rauffenstein discovers they are both officers, he asks for them to brought before them, and he soon discovers that de Boeldieu is a wealthy and cultured patrician, like himself, and that they even have common acquaintances. This introduces one of the film’s thematic strands: the commonality that upper-class Europeans have that transcends national borders. Von Rauffenstein feels an instinctive affinity with de Boeldieu, because they share a set of values and a common code of behaviour. But he feels nothing of the sort for Marechal. Act 2: Prisoner-of-War Camp N17, Hallbach. At this officers’ camp, de Boeldieu and Marechal join a rowdy group of French prisoners. Among the prisoners is a former music hall stage actor, Cartier, who is constantly mugging and showing off before the others. Another inmate is Lieutenant Rosenthal, a wealthy Jewish businessman who shares with his fellow prisoners the abundant food parcels that are sent to him by his family. All of them besides de Boeldieu are middle or lower class, and they feel a feel a sense of bonding with each other that they don’t share with de Boeldieu. This displays a second theme: the comradery shared by all kinds of people with a common nationality, in this case French. During this act, the high-spirited group of French prisoners engage in an arduous effort to dig an escape tunnel out of the prison camp. Just as they are about to make their escape, though, they are all transferred to other prison camps. Upon their departure from the camp, they are unable to inform the incoming British prisoners of the existence of the tunnel due to the language barrier separating them. Act 3: Prisoner-of-War Camp N14, Wintersborn. The third act begins after an intervening montage sequence indicating that some time has elapsed and that the prisoners have been scattered and shifted across a number of different prison camps. Finally, de Boeldieu and Marechal find themselves transferred to the Wintersborn camp, which is located in an old medieval fortress. There they find that the commander of the prison camp to be von Rauffenstein, who in the intervening years has evidently suffered severe spinal injuries and burns so that he is unfit for active combat and has been assigned to run the remote prison. The injuries, in fact, have now forced von Rauffenstein's behaviour and manner to be even more exaggeratedly stiff than ever. Von Rauffenstein examines the dossiers of de Boeldieu and Marechal and observes that they have both attempted numerous escapes from their previous prison camps. He informs them that escape from this one will be impossible and, in his stiff manner, cordially gives them a tour of the old fortress. This is an interesting sequence displaying Renoir’s artful moving-composition cinematic techniques and is discussed in detail in “The Tour of the Fortress in Renoir’s La Grande Illusion – a Scene Analysis”. Marechal and de Boeldieu learn that their old friend Rosenthal is also imprisoned here, and they join up again and start plotting how they might escape from this prison. It will require a lengthy handmade rope and some sort of decoying action that will distract the guards. De Boeldieu, living up to his sense of honor, decides that he must serve as the decoy and sacrifice himself in order for Marechal and Rosenthal to escape. In the event, de Boeldieu is shot and killed by the reluctant, but equally honor-bound von Rauffenstein, but Marechal and Rosenthal manage to get away via the rope. Act 4: Escape. In the final act, Marechal and Rosenthal set out on the road seeking to escape Germany. Rosenthal has a badly injured foot, though, and they have no choice but to seek shelter in a rural farmhouse that is tended by a widowed German lady, Elsa, who is looking after her young daughter. Elsa’s husband and all her brothers had already died in the war, but she sympathizes with the human plight of the two French escapees and takes them in. While Rosenthal recuperates, the two settle down for awhile, helping the young widow with the farm work. Though Marechal and Elsa eventually fall in love, Rosenthal and Marechal finally realize they have to leave, and they set out again on foot. They finally find the Swiss border and make it across before a pursuing German attachment can get them. von Rauffenstein and de Boeldieu. The working-class Marechal cannot easily relate to the two aristocrats, and the contrast between their strict codes of honor and his own down-to-earth humanism is constantly emphasized. Von Rauffenstein and de Boeldieu live by an outmoded set of rules that have often had destructive and inhuman consequences. De Boeldieu, in fact, acknowledges that the world will soon do without people of his type, and he effectively chooses to bow out by sacrificing himself for his two “humanist” comrades. Rosenthal. Marechal sometimes displays thoughtless antisemitic prejudices, but his instinct to take all people as human beings eventually wins out. This, of course, contrasts with the antisemitism that was having such terrible consequences in Germany at the time. Elsa. Marechal overcomes whatever feelings he may have against the German enemy and falls in love with her. Again, the universality of humanism triumphs over local prejudices. Renoir’s presentation of the virtues of liberal humanism – that “man is the measure of all things” – entails an external, universal, and “objective” narrative view of the action. The camera’s point of view is not personally involved and subjective, but is seen from the perspective of a sympathetic, but somewhat detached, “silent witness”. This is achieved by Renoir’s preference for medium and long shots involving multiple characters, often in movement. The resulting point of view is thus more global and all-encompassing. His approach contrasts with the existentialist mise-en-scène of his contemporary and rival, Marcel Carné, who was the champion of “poetic realism”. Carné’s work was atmospheric, emotional, and often fatalistic concerning the romantic longings of his individual protagonists, while Renoir’s work was more reflective about the larger scheme of the human enterprise. 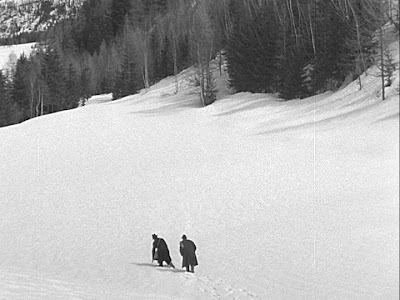 The work of both Carné and Renoir induce in the viewer a feeling of melancholy. Carné’s melancholy concerns the eternal loneliness of the individual and the hopelessness of romantic fulfilment. Renoir’s melancholy is less personal and more reflective on universal truths affecting humanity. Here in La Grande Illusion, there is an implicit faith underlying the film that ultimately the universal commonality of humanity will overcome the depredations of nationalism, racism, and outmoded social class distinctions. Yet Renoir's view is not completely optimistic. World War I brought about the senseless deaths of 15 million people. France suffered 1.3 million battlefield deaths, and Germany s uffered 1.7 million deaths on the battlefield. These people died because of stubborn adherence to the prejudices and traditions that humanism is supposed to overcome someday. At the end of the La Grande Illusion, it is unclear in the narrative whether or not the now-free Marechal and Rosenthal will return to France and rejoin the armed struggle. They have passed over the artificial line of the Swiss border, but they may not have passed beyond the artificial barriers in their minds concerning the evils of war, itself. When we viewers watch the film today, knowing the horrors that awaited Europe in World War II, we may be even more circumspect than Renoir was in 1937.